We’ve previously discussed some of the many changes that are coming for alimony payments: The Tax Cuts and Jobs Act will officially eliminate the deduction for any divorce agreements executed after December 31, 2018, sending many into a panic (and a rush to finalize their divorce agreements before then). These tax deductions were historically significant and often took some of the financial strain off of divorce proceedings. However, it is important to note that—simply because this deduction has been eliminated—not all is lost: couples seeking a divorce can expect individual retirement accounts (IRAs) to now feature more prominently in divorce discussions, as we discuss in greater detail, below. One option is to provide the recipient spouse with an IRA as a lump-sum payment (i.e. alimony payment). This allows the spouse with the higher income to unload money that would have otherwise cost them in taxes had they withdrawn it. By providing the lower-earning spouse with the IRA, you are effectively unloading money that you would have otherwise paid taxes on; thus, you are essentially getting a deduction. Similarly to the way that alimony payments used to work prior to the new law, the receiving spouse then has to pay income taxes once they deduct from the account, and the transfer of one account—from one spouse to another—is tax-free. It can provide the recipient spouse with tax-deferred growth and even a potential retirement income. What About Funds Needed ASAP? However, it is important to note that this IRA transfer arrangement is not suitable for individuals who need spousal support right away, as the recipient spouse will face taxes and penalties from making early withdrawals from the IRA. This rises to a 10 percent penalty if the recipient spouse is under 59 ½ years old. When payments fail to meet the tax-law definition of alimony, they are treated as “other” payments—such as those that divide the marital property. These are nondeductible for the payer and tax-free for the recipient. However, that does not mean that nondeductible alimony can’t be funded with property, and that property does not have to come in the form of an IRA. It can come in the form of real estate, retirement plan funds transferred from a 401(k) under a qualified domestic relations order, stock shares, or balances from individual retirement accounts. 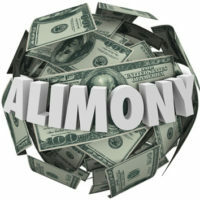 If payers of alimony can transfer tax-favored account balances through a property settlement or as alimony itself, they can take advantage of a tax-saving opportunity. If you have questions about your divorce, finances, distribution of assets, alimony, or any other family law question, contact our experienced Broward County family law attorneys at Trachman & Ballot-Lena, P.A. today to find out more.